This week of National Craft Month, I want to talk about trends and how they relate to our favorite pastime of crafting! If you look up the word, "T R E N D" in the dictionary, you will see the definition as "a general direction in which something is developing or changing." The definition goes on to talk about fashion, beauty, politics, cultures, real estate, business and science as factors that help to determine trends. For us in the craft and hobby industry, the word "trend" is very important as trends help us to determine new crafting arenas, to expand on existing crafts, and to select new color palettes and textures. It is our lifestyle needs or desires that also help us establish our crafting trends. 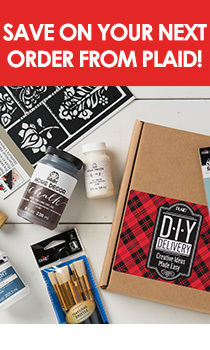 Here at Plaid, we take pride in the fact that as one of the largest manufacturers of materials used in the craft and hobby as well as the DIY industries, we are recognized as being a top trend setter. We know and watch current trends enabling us to develop products which are valid, current, and desired by the masses. You may ask, how do we do it? As a leader in the craft industry, Plaid supportively invests in its employees. Allow me to introduce you to Jackie Wynia our Design Director. So far this year, Plaid has sent Jackie and a small team of Plaid employees to Germany and France. While overseas in Europe, our Plaid team was able to attend several trade shows well known for illustrating upcoming trends. Because these types of company investments, the knowledge obtained while on these trips, and additional trend research projects, Plaid is able to not only spot a trend, but help develop the trend as it relates to our favorite pastimes of arts and crafts! How often are you able to travel to research trends? I make between four - six trips per year both internationally and domestically. How do you determine what the "take-away" is from attending these shows and events? It is an on-going process that Plaid has been doing for many years, we have established aesthetics that we are always refreshing and building on so I look for those concepts, styles and motifs that relate to our product lines. How do you relate to crafts that you observed as a current or upcoming trend? There is a misconception that someone or anyone can just randomly select colors and motifs that will be trendy. Trends are based on social, economic and environmental events and needs. For example the current trend to "Recycle, Repurpose and Reuse" is a result of the economic fallout that started in 2008. We are on the road to recovery, but it did help to establish a sense of consciousness and appreciation for the past. This contributes to the trend we are seeing in crafts to refinish furniture, preserve what we have and enhance it. Are these traveling trips the only way you bring trend-watching information to Plaid? No, we work closely with designers, licensors and professional trend-watching experts on an ongoing basis. How do you spot a crafting trend or know what will become a popular color palette this year? Color experts such as Pantone establish a color of the year based on the cultural trends I mentioned. Trend styles also help to determine color palettes, they go hand in hand. The influence is Global from tribal beadwork or ikat and batik textiles from Indonesia, to block printing from India, these amazing authentic handicrafts inspire our color palettes. There is a growing appreciation for quality handcrafted products in decor and fashion. This leads the consumer to want to create these types of items for themselves, both for the beauty as well as the pleasure/satisfaction of creating. On a social level we are reacting to the necessary and sometimes unnecessary use of technology; we are constantly using and handling a cell phone, laptop, reader, or tablet, etc., it feels good to touch wool, driftwood, twine, paint and then create something from those natural materials. Please share with us ... Was there one BIG idea or trend from this last trip that you observed many times over? It is the trend of Handcrafting, DIY and Make. Do you enjoy the traveling and what is the best part of your trend-watching / research trips? I feel very fortunate to travel, I love it! I'm also very fortunate that my work is also my personal passion - creating, art, crafting! Have you ever noticed a fad or trend that is already current or relevant to what Plaid currently has manufactured? If so, what examples can you share? Another huge trend that was very evident in my recent travels was hand stitched needlework of all kinds. And here at Plaid we are developing and adding to that trend by providing the needle crafter Bucilla kits designed by Rachel Faucett of Handmade Charlotte. Rachel's designs are trendy, global motifs stamped on denim which create a stylish "Boho Chic" feel; she also designed a trendy, new surface that is so different from aida cloth ... have you ever thought about counted cross stitching on a wood form? If you haven't, you may want to try a design or two from our Bucilla Handmade Charlotte Wood Stitchables line .... These wood stitchables are not only fun, but they are quick and easy to complete too! One last trend that I had spotted and would like to illustrate here about how Plaid is on top of the crafting trends is ... the global influence of block stamping. Here's a sneak peak of the Fabric Creations Block Printing program we'll debut on plaidonline.com soon! Take a look at how easy it is to create fashion wearables and home dec fabric creations using Fabric Creations block printing stamps and super soft fabric inks in a wide range of colors! Thanks, Jackie for sharing with us all your trend explorations!